Here you will find our proposals for travel agencies, companies, clubs and associations which would like to offer to their clients, personnel or members an outdoor sport activity incentives or teambuilding in a scenic location in the Trentino Dolomites. Our School of mountain guides is taking care of the complete organization and will prepare an individually tailored program for every teambuilding, outdoor incentive or professional event and meeting. During our sports activities such as canyoning, rock climbing, hiking and trekking, the participants will be accompanied exclusively by our professional Mountain Guides. 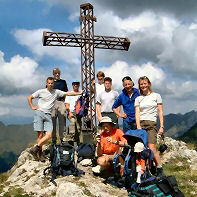 Please see below the description of the outdoor incentives and teambuilding activities of our Mountain Guides School. Further information or reservation only by e-mail to arco@alpinguide.com. The destination of our hiking is the Natural Park "Corna Piana" at the foot of Monte Altissimo (Baldo) or even its peak at 2.059 m. We are proceeding on easy paths, following the trails of the first World War, through the Natural Park which is very well-known for its endemic plants and animals. 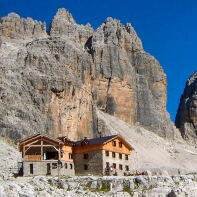 We always choose a cosy mountain hut as a destination for our outdoor activities. There the participants will have time to relax and enjoy a typical local snack at very reasonable prices. We strongly recommend to visit the peak of Monte Altissimo, the "balcony over Garda Lake" from where you can indulge in the panorama of the entire Lake Garda, as well as the Trentino Dolomites. According to the wish and physical condition of the participants, it is possible to choose from several alternative tracks leading to the top of Monte Altissimo. 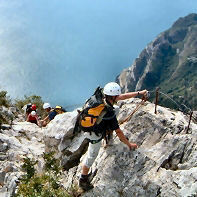 via ferrata (Italian for "iron road". Plural vie ferrate. In German, Klettersteig) is a mountain route which is equipped with fixed cables, stemples, ladders, and bridges. The use of these allows otherwise isolated routes to be joined to create longer routes which are accessible to people with a wide range of climbing abilities. Walkers and climbers can follow via ferratas without needing to use their own ropes and belays and without the risks associated with unprotected scrambling and climbing. 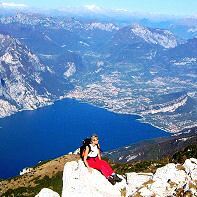 In the area of Lake Garda there are many easy but panoramic trekking on via ferratas. These incentive trips are reserved for people with a little mountaineering experience and who do not suffer from vertigo. Our alpine school is proud of its many years of experience. We have noticed that everyone regardless of age or special physical preparation, who practice rock climbing for the first time are very much impressed and enthused of the surprising semplicity of this outdoor activity. The same applies to canyoning which is nothing else but roping down ("Abseiling") canyons and torrents accompanied by one of our officially licensed alpine and canyon guides. The necessar gear will be made available by our school free of charge. The area around Garda Lake with a plentiful variety of canyons and torrents - has become the center for this new outdoor activity with an ever increasing number of devotees. The participants of both of our teambuilding activities will be accompanied by government licensed and officially registered alpine guides who are bound by law to have a third party liability insurance. Once in a life-time ! Many are dreaming to spend the night in a mountain lodge after a typical local dinner in a cosy atmosphere surrounded only by the peace and quietness of the perennial glaciers. This offer is destined for groups with 20 to 35 participants and includes the accompaniment of a licensed mountain guide for the ascent and descent as well as the illustration of the particular historical and alpine features. The choice of the mountain lodge is season-bound and depends on the request of the participants as well as the culinary quality. The proposal of our "active-week" is mainly destined for a sportive group of friends or students who do have the physical condition and the interest to pass a week filled with ACTIVITY in the mountains. During the past years, we have satisfied many German organizations/schools who had decided to confide their students to us during their school holidays for them to pass a vacation in sound activity. This is the weekly program: Monday - CLIMBING; Tuesday - ROCK CLIBING; Wednesday - CANYONING; Thursday and Friday - TREKKING WITH OVERNIGHT STAY IN A MOUNTAIN LODGE. THESE PRICES ARE APPROXIMATE PRICES AND ARE VALID ONLY FOR AGENCIES AND/OR INTERMEDIATE AGENTS WITH WHOM WE HAVE A CONTINUING BUSINESS RELATIONSHIP. THESE PRICES INCLUDE THE RENTAL OF THE TECHNICAL EQUIPMENT WHICH IS NECESSARY FOR THE PERFORMANCE OF OUR INCENTVES AND TEAMBUILDING. Each Guide of Alpine Climbing School Arco are government licensed mountain guides with international diploma and are officially registered with the regional and international Mountain Guides' Association. With no exception they are bound by law to have a third party liability insurance.